Harold Pinter was one of my favorite playwrights. We studied his play “Betrayal” and I wondered what kind of person could write such realistic dialogue with strong, almost mighty, subtext. Actors loved his plays because the subtext allowed them to create a situation that could be completely opposite the dialogue. My theory on Pinter is that his dialogue had to have come from real life. He must have been a master eavesdropper and an excellent listener. I never found out. This memoir, or biography, or whatever you would call it, is all about Lady Antonia Fraser. She is called Lady Antonia Fraser because she is the daughter of an Earl. She was first married to Sir Hugh Fraser and had six children with him. They divorced in 1977, leaving her free to marry Pinter. 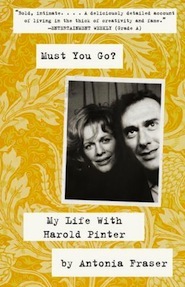 Her affair with Pinter started in 1975 when she moved in with him. She was well known for writing several historical biographies and detective novels. Pinter was a Nobel Prize winning English playwright, screenwriter, actor and director. He was married to Vivien Merchant when he met Fraser. Merchant would not grant him a divorce even though he had been living with Fraser for four years. They had one son together. She granted him a divorce in 1980. He lived with Fraser until he passed away at age 98 from cancer. This memoir is written in diary form. There’s the year, and a little preface, then the date, then what they did that day, who they were with, where they were with notes occasionally inserted by Fraser in the here and now. It’s nice because we get to see her recollection of their initial meeting. She also admits sharing her diaries with Pinter but that he didn’t read most of them. The ones he did read he would pencil in comments. So then we have her commenting on his comments of her recollections, which is a little bit strange because 1) it’s really personal and B) he’s dead. Even dead he has a better sense of humor than Lady Antonia. Now I feel guilty for wishing Pinter had just written the whole thing. So I was bored. How can a woman who, when married have an affair with another married man, move in together, and write a boring memoir about it? Lady Antonia Fraser can. Otherwise I was bored because I didn’t recognize many of these famous old British people. In order to really enjoy the book, I would need to hail from England and be from an older generation. At its best, this memoir is as Fraser describes (noting Pinter’s creative periods) ” . . . this was a consequence of a biographer living with a creative artist and observing what went on first hand.”. A noble cause. I look forward to this. I too love Pinter’s plays, with The Homecoming being one of my favorite pieces of literature. I re-read it frequently, and feel differently every time.